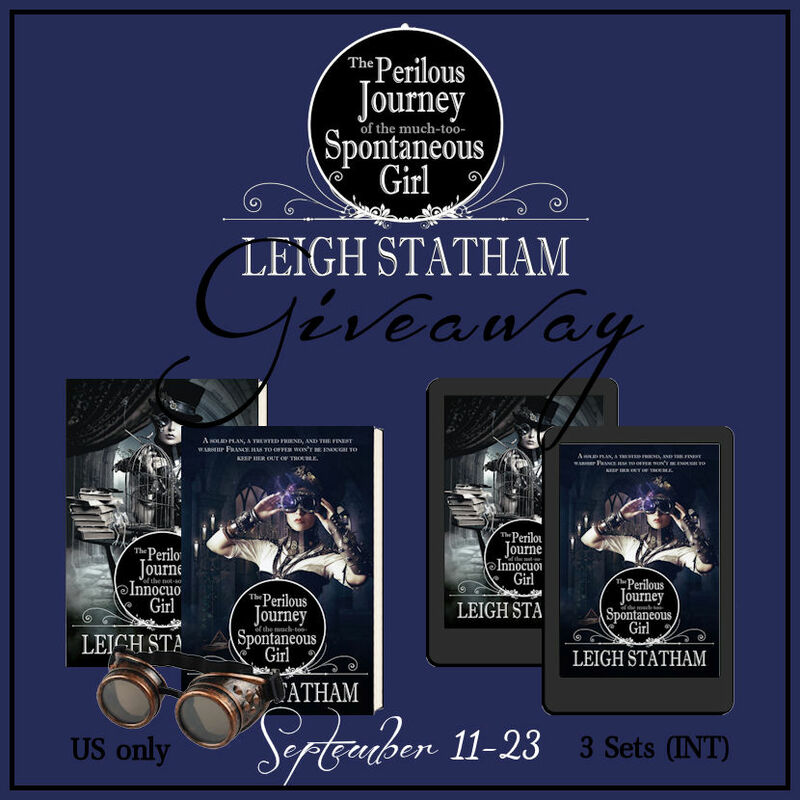 Bookworm Lisa~: The Perilous Journey of the much-too Spontaneous Girl by Leigh Statham + tour giveaway! 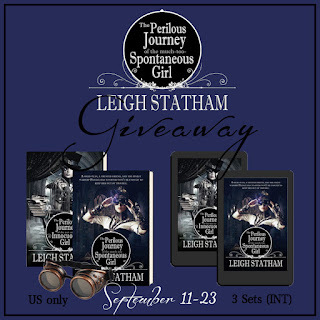 The Perilous Journey of the much-too Spontaneous Girl by Leigh Statham + tour giveaway! Lady Marguerite Vadnay and her trusty automaton, Outil, have settled into life in New France rather well. Marguerite is top of the class at flight school and her future as an aerpilot is nearly secure. 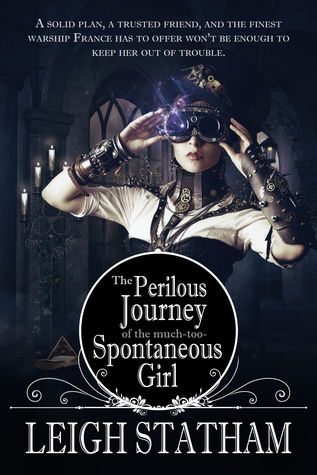 She has everything she wants— except a commission on the pirate hunting dirigible The Renegade. Using every card in her aristocratic arsenal, Marguerite wiggles her way onto the finest warship France has to offer. 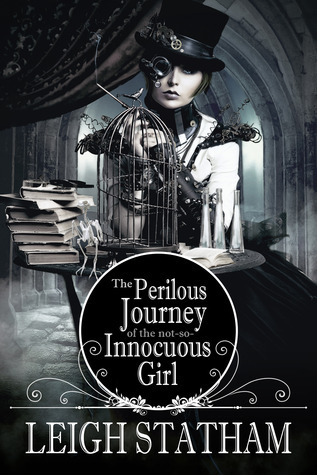 But as usual, Marguerite’s plans endanger the lives of those she holds dear— only this time no one else is going to save them. As Marguerite and Outil set off on a rescue mission they may not return from, she finally realizes it’s time to reorder her cogs. 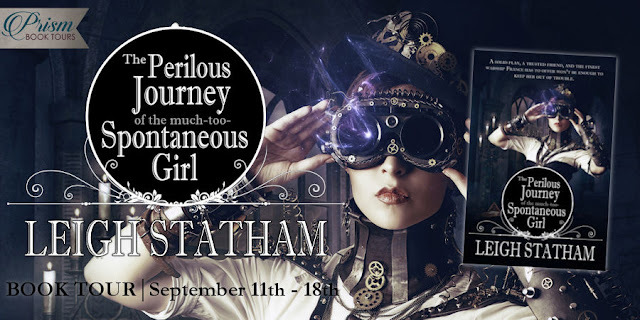 This steampunk adventure is littered with facts from The Golden Age of Piracy and follows (not too closely) some of the lives and adventures of the brave men and women who sailed the seas as privateers, pirates and soldiers. Marguerite sighed audibly, realizing that she’d held her breath during the entire launch. She eased her controls to the right and the thrusters kicked in, propelling her forward and to the right. “Yes!” she cried out to the endless blue sky in front of her. The controls felt so right in her hands. She began to execute more maneuvers. The tiny ship felt like an extension of her own body. She dove to the left, steered it back up, turned tight to the right, centripetally swinging her own compartment in the opposite direction. She laughed. What a thrill! Months of study and hard work, tiny rooms and terrible food—this was completely worth it. A flock of birds flew past her, swirling around, welcoming her. They dove and skimmed the surface of the St. Lawrence River, then swooped back up along the edge of a brick building. “That looks like fun,” she said to herself. Laying on the controls, she took the little ship in a steep dive toward the aerstrip. Her heart floated in her chest, her breath caught in her throat, and she giggled with delight as the ship responded to her demand and swooped back up. It leveled off like the birds, just in time for the envelope to catch on a breeze and be blown into the windsock tower. Before she could call for help, Marguerite was whipped around the tower, her envelop caught in the trusses. She banged into one pylon and then another, the glass around her shattered, tearing at her exposed cheeks and nose. She cried out and braced herself for impact with the ground, her giggles from the moment before were now cries for help. Leigh Statham was raised in the wilds of rural Idaho, but found her heart in New York City. 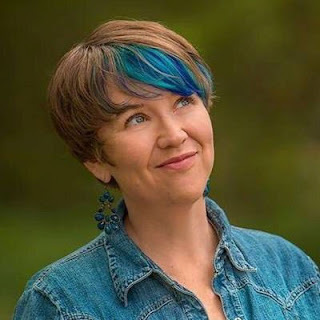 She worked as a waitress, maid, artist, math teacher, nurse, web designer, art director, thirty-foot inflatable pig and mule wrangler before she settled down in the semi-quiet role of wife, mother and writer. She resides in North Carolina with her husband, four children, five chickens and two suspected serial killer cats. Leigh is also a founder of QuantumFairyTales.com and is currently serving a life sentence there as senior editor and gnome driver. She loves all things sparkly and strange that go bump in the night.